Forum Index > Historical Arms Talk > Portuguese arquebuses in the early 16th century? Posted: Tue 22 Mar, 2016 9:31 pm Post subject: Portuguese arquebuses in the early 16th century? Does anybody have any good sources on arquebuses in the early 16th century? Is there information on the German exportation of firearms of this period? Posted: Tue 22 Mar, 2016 11:33 pm Post subject: Re: Portuguese arquebuses in the early 16th century? 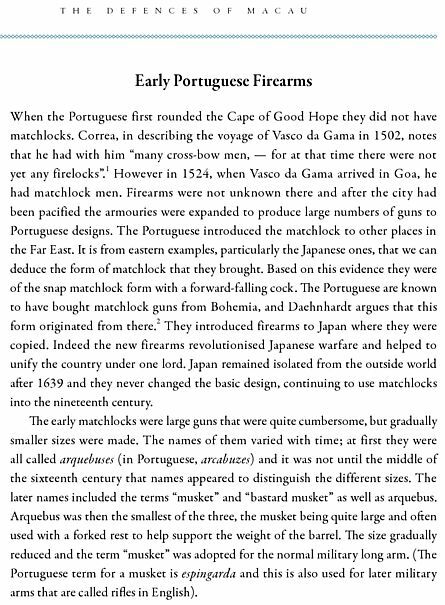 It was the Portuguese that introduced the matchlock to Japan and other south Asia countries. How they were made is a very interesting story. When the Portuguese captured Goa India in 1510 they acquired the gun works and smiths that were producing firearms for their enemies. This type of gun with a European type snap matchlock mechanism were quite different than the matchlocks used in India, Persia and the Ottoman empire. Rare Portuguese (Goa, India) Snap Matchlock Gun, ca. 1560, Dresden Museum (Rüstkammer), presented to the Saxon Elector Christian I. by Francesco I. de Medici, Grand Duke of Toscana, in 1587. Overall length 164.2 cm, barrel 136.3 cm, bore 13.8 mm, weight 6,320 g. In decor, techniques of painting and materials mingle Portuguese, Muslim-Indian and Japanese influences. Thanks for the information Eric, that is interesting. I should have been more clear, what I need is sources from or a few years before 1503. It would be nice if it was something I could cite. Isaac, I am not sure if there is much info from that time period, I wouldnt mind seeing it could be found. What an interesting extract, Eric. May I ask where it is from, please? Thanks for these recommendations, Eric. Posted: Thu 31 Mar, 2016 11:34 pm Post subject: Re: Portuguese arquebuses in the early 16th century? I find the statement that the Portuguese did not have arquebuses at all by 1502 to be dubious. That statement was merely for those specific Portugese on those specific ships, not the Portuguese as a whole. Arquebuses were spread across Europe by the late 15th century, in Italy and Hungary they were already in mass usage on the field by the 1470s-80s. As far as Portugal, hand-held guns [tiros de fogo] and espingarieros ['riflemen'] appear for the first time in Morocco with King Duarte’s expedition against Tangiers in 1437. As the Portuguese Tapecarias da Tomada de Arzila from 1471 also show various firearms, among them a couple of arquebuses. Interestingly enough, they recently found one Vasco da Gama's ships and recovered a few arquebus barrels, which are believed to be German. Posted: Sat 02 Apr, 2016 6:25 am Post subject: Re: Portuguese arquebuses in the early 16th century? Mario, can you post any references for this information. Posted: Sat 02 Apr, 2016 10:14 am Post subject: Re: Portuguese arquebuses in the early 16th century? The main topic is Morocco, but with it, the information about the Portuguese is also presented. They are at the very bottom. Here is the expeditions website.